Painting in Singapore is a little more challenging than I expected because of the humidity – the paper just never dries. It never occurred to me that this would be a problem, but if you control the wetness on the brush (keep it drier than usual) it becomes manageable. I was on Waterloo Street by 7 am, hoping to get there before the crowds gathering around the two temples on that section of the pedestrian mall. The vendors selling bunches of flowers and red sticks of incense were just setting up, and the street lights were still on. It’s always a magical sight to see a city waking up. You are adapting beautifully. You will never regret this trip! Beautiful! What a wonderful experience. Thoroughly enjoying your latest works. Enjoy and thanks for sharing! Loving these! Sounds like an amazing trip and so interesting to live vicariously. This is absolutely beautiful! This is beautiful. I’ve just been struggling with sketching on holiday in Florida, then I look at your painting and you make it look so easy. I’ve got to learn to get my light values sorted out and simplified, I’m trying to learn from your paintings. Why do I feel like sketching and painting, everytime I look at what you do? Love your compositions, they always are full of light and beautifull colors. Wish I could travel one day…You can be sure that if I do, I will have a sketcbook with me! So lovely! The colors are wonderful. Oh, Shari! This painting is just so very lovely. From the colorful umbrellas, the people, buildings, and trees-the whole scene really catches my eye. The street name also made me smile. :-). I am from Waterloo- but in Iowa. Maybe it’s just me but there doesn’t appear to be much detail. It becomes detailed as my eyes and mind take in the scene. You just feel like you’re there, or have been there. It’s universal in it’s way, but your rendering makes it unique. What a gift you have, and how you pursue. 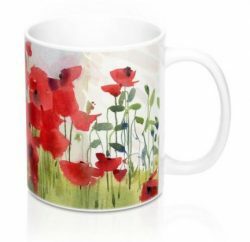 Shari, I know of a UK artist who goes out plain air painting in all weathers and as you know it’s often very damp there. He carries a gas-powered chef’s brûlée torch in his pocket to dry the paper if he’s having a problem with drying time. 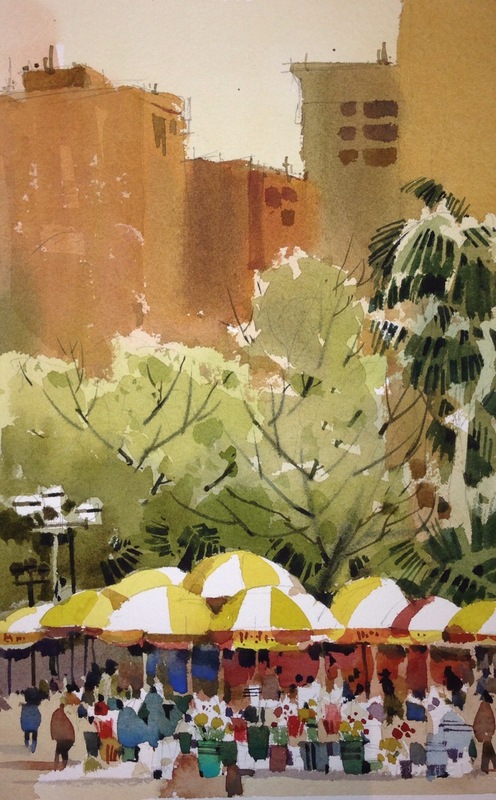 I love the way you handled the trees in this painting , Especially just above the umbrellas . Interesting …. You seem to be adapting very well. I agree with Louise! Every time I see your work, I feel excited and anxious to paint! You inspire others by making it look so easy and beautiful. So far from the truth though! Great! I really like the way you handled the middle ground foliage. I think I’m adjusting to the heat. Or else the temperatures so getting cooler. I think you are getting used to the heat… my experience of Singapore is that the temperature is almost the same day after day… the difference between a hot day and a cold day is about one degree. I think that must be it. One of the organizers said that there are two seasons in Singapore: hot and hotter. This one is “hotter”. The lower bits of the trees in the dark green with the flat brush are especially striking–the whole painting, as usual, is wonderful. So fun to see a different place with you.